Every mouthful of food we eat is teeming with chemical reactions . Adding ingredients and cooking helps us control these reactions and makes the food taste better and last longer. So what if we could target food at the molecular level, sending in specially designed particles to control reactions even more tightly? Well, this is exactly what scientists are trying to do and it has already produced some impressive results – from food that tastes salty without the health risks of adding salt, to bread that contains healthy fish oil but without any fishy aftertaste. Another example of nanotechnology’s use in food manufacturing is nano-encapsulation . This technology has been used to mask the taste and odour of tuna fish oil so that it could be used to enrich bread with heart healthy Omega-3 fatty acids. Fish oil particles are packed into a film coating that prevents the fish oil from reacting with oxygen and releasing its smell. The nanocapsules break open only when they reach the stomach so you can receive the health benefits of eating them without experiencing the odour. Despite all the opportunities nanotechnology offers the food industry, most developments remain at the research and development stage. This slow uptake is due to the lack of information about the health and environmental impacts of the technology. For example , there is a concern whether ingested nanomaterials migrate to different parts of the body and accumulate in certain organs, such as liver and kidneys. This may then affect the functionality of these organs in the medium to long term. Research has shown , for example, that consumers are more likely to accept nanotechnology when it is used in food packaging rather than in food processing. 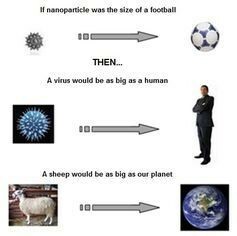 But nanotechnology in food production was seen as more acceptable if it increased the food’s health benefits, although consumers weren’t necessarily willing to pay more for this. In our recent research , we found no strong attitudes towards or resistance to nanotechnology in food packaging in the UK. But there was still concern among a small group of consumers about the safety of foods. This shows how important it will be for food producers and regulators to provide consumers with the best available information about nanotechnology, including any uncertainties about the technology.